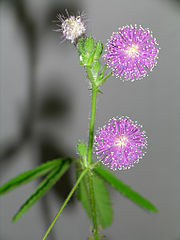 Mimosa pudica is an angiosperm. This means that it is a flowering seed plant. Its seeds are usually dispersed by wind or animals. In order for it to create seeds, it must be pollinated. Pollination can occur by wind or other methods of transfer of pollen. Because angiosperms have flowers, they can attract insects and animals as pollinators. M. pudica is a “perennial” meaning it can live longer than two years (Ombrello). However, it is sometimes cultivated as if it were an annual (Ombrello). You can see the flowers of Mimosa pudica in this image. To learn more about this fascinating plant, you can have a look at Dr. Thomas Ombrello's page where he wrote about it more. You can go on to the Habitat page to learn more about where this plant lives. To see the refrences cited above, you can go to the Refrences page.